Exo360 is a quadcopter drone equipped with 5 lenses to provide fully spherical photos or videos. The Exo360 appears to be the first commercially available drone with built-in 360 capability. The Exo360 uses 5 fisheye lenses, each with a 210-degree field of view. For the pro model, each lens is paired with a 16mp sensor. For the regular model, each sensor is 12mp. Four of the lenses are coplanar and face the cardinal directions while one lens faces downward. It doesn’t have a lens facing upward but it appears that the 4 coplanar lenses have sufficient field of view that when stitched, the upward view is captured as well. The photo is stitched onboard by the drone’s processor. Queen B Robotics claims that the photo resolution is up to 60 megapixels with 4k video at 30 fps (Pro). For the regular model, the video is 1080p at 30fps. Queen B also says that the Exo360 can provide a livestream. Although many drones provide a livestream from the onboard camera, in the case of the Exo360, it is a remarkable feat, given that the processor will have to stitch images from five cameras, with a lag that is small enough to allow the drone to be flown using the livestream. One possibility is that the livestream is not a stitched view and instead the user can select which camera to view for the livestream. – a radio controller is “optional”. Instead, the Exo360 uses a smartphone. This is unusual for prosumer drones, which have dedicated controllers (often with its own LCD display). – Most prosumer drones have gimbals for their cameras to provide a stable video (and to rotate the camera). The Exo360 has no gimbal. It doesn’t need to rotate the cameras. I am also speculating that the video will be electronically stabilized. – Some high-end drones have a retractable landing gear so that the landing gear is not visible in the shot when the camera rotates. In the case of the Exo360, four of the cameras are on the perimeter of the drone, while the landing gear is just slightly within the perimeter, outside of the view of the four outward facing cameras. 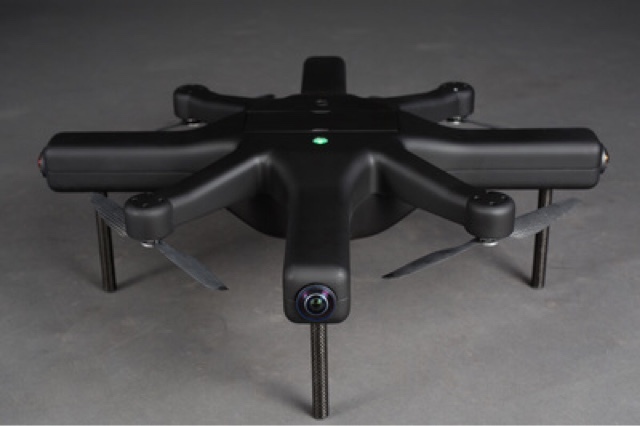 At the same time, because the downward-facing camera doesn’t have a gimbal, it can be close to the body, which means the landing gear need not be very tall. The short landing gear stay out of the view of the downward-facing camera. – Similarly, the rotors are outside the view of the cameras. The Exo360 will begin its Indiegogo crowdfunding campaign on May 31, with delivery projected for Fall 2016.